One of the benefits of book shopping online is the little "based on this title, you might like" strip that comes up across the bottom of a page. 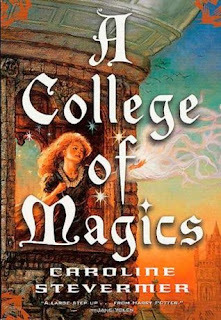 I had one of these pop up during a recent Powell's visit and was recommended A College of Magics by Caroline Stevermer. 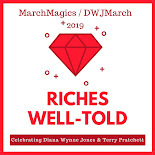 She is one of the co-authors of Sorcery and Cecilia or The Enchanted Chocolate Pot and also of a lovely short story that I read in the Queen Victoria's Book of Spells collection (with Ellen Kusher, whose group effort Tremontaine I'm reading right now!). I had never read one of her solo books though but figured I couldn't go wrong, especially by grabbing a used copy of this out-of-print book. Well, you can probably guess how this went ... LOVE. I was just trying to write up a regular plot summary but it sounded so stupid and flat compared to the actual story. The back of the book makes it sound like a boarding school tale, which it admittedly is at the start. But there are three parts to the story and the second two are full of real life and high stakes adventures. Faris, the main character, is a couple years from coming of age at the beginning of the story and has an "evil" uncle who is ruling her country of Galazon until she is 21. And the school? It seems like a normal finishing school but the girls who excel there are those that are able to use magic. But do they teach magic at the school? Not really. It's just theoretical instruction and then innate ability just kind of takes over by the time the young women are ready to leave. Faris hates it at first but then finds friends and loves it and then, of course, is pulled out early by her evil uncle, but not before things go totally wonky with her nemesis, Menary. And then once she leaves and heads toward Galazon by way of Paris, the adventures/perils begin, with real consequences for Faris, her companions, and her enemies. Some of the things that happen are actually quite intense. The back of the book says "ages 10 and up" but there are some violent things that happen that seem more appropriate for a slightly older kid. I say this because the intensity did something to me, the adult reader. During the days I was reading this book I was tense and stressed and had to keep getting back to it. The world felt so real and Faris's eventual mission so important that I ended up speeding through the almost 500 pages of story. Then the ending was so unexpected, so outside of normal children's fiction norms, that I ended up in awe of Stevermer and her feminist ideals. 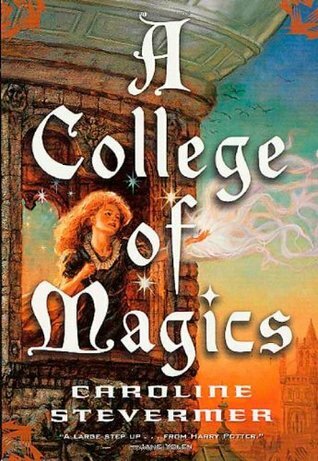 As this book was first published in 1994, did any of you read it as a kid/teen? I'm really curious how a young reader would actually handle some of the things that happen in the story. Also, I would LOVE to see this book made into a film. In the meantime, I'll just search out more of Stevermer's books and collaborations and enjoy her fabulous worlds! So far everything seems to be kind of a middle ground between middle grade and YA. I like it! I think I read it maybe in my late teens? I don't specifically remember! My vague memory is that I found the ending baffling. I should reread! The ending was definitely surprising and would be very strange from a kid/teen reader's perspective. I thought it was quite original though. I hope you do reread because I want to know what you think now! Oh, I really liked The Enchanted Chocolate Pot! (with a title like that, how could I not!) And it never occurred to me to look up what else Stevermer wrote. This one sounds good. I never looked either so I'm glad I happened upon this one! OMG I was so happy to see this title in my reading list, and then to see that it was you who read it! I read it just after it had come out (I was... 12, 13?). It was just the sort of thing I was looking for - a great story, with magic! I didn't think it was too old for me then... but I had read Tess of the D'Urbevilles the year before. I mean, I loved this book. I haven't connected with everything Stevermer has written, but this one and the next two in the series? YES, yes, yes. I'm really glad that you mentioned the sequels because I wasn't sure if I should track them down because, at least the second one, isn't about the same characters. Now I'll definitely hunt them down! The books are new to me so I am so glad I came across your post. Thanks for the review.